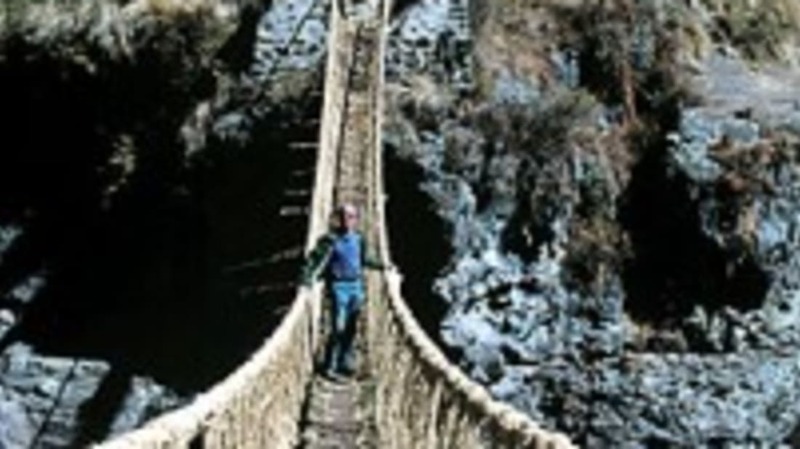 Incas in the Andes mountains were weaving rope suspension bridges from wood fiber and grass before European colonization in the 16th century, which acted as vital connections along ancient mountain roads. Made from inherently degradable material, the bridges had to be rebuilt annually to prevent dangerous sagging. One such bridge, spanning a canyon of the Peruvian River Apurimac, has survived in this manner for more than 500 years. But even though the Incans invented their bridge free from outside influence, they weren't the first ones to do it. The ancient Chinese, for instance, had them beat by more than 1500 years: evidence exists there of iron chain suspension bridges dating to the third century BC.